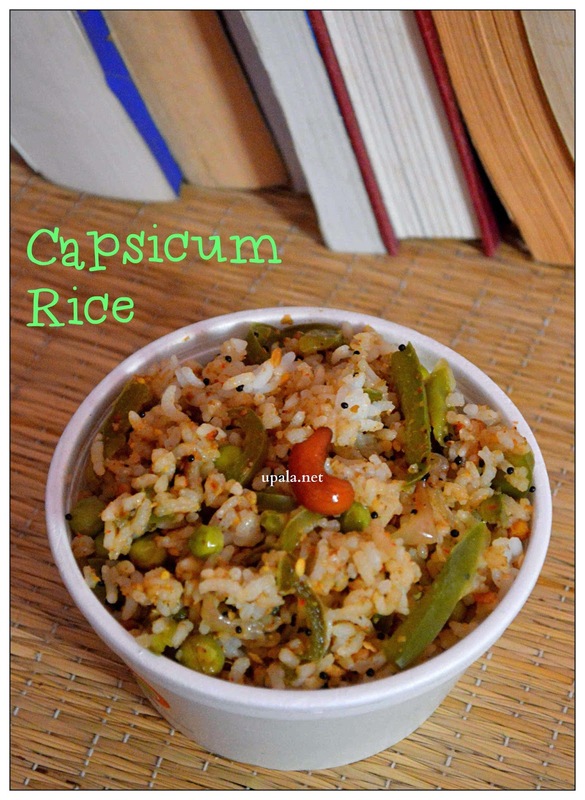 Capsicum/Bell peppers Rice is a tasty Rice that can be prepared easily. Curry powder is an easy multi purpose powder that you can prepare at home. It comes handy when you prepare poriyal, kootu, sambar etc. I have already given separate post on how to prepare this powder in bulk, click here to get the recipe. If you want to prepare this curry powder only for this Rice, follow this procedure. 1) Heat a kadai with a drop of cooking oil, add a small piece of Asafoetida after it gets roasted, add Red chillies and fry. 2) Then add Channa dal, Urad dal, Coriander seeds, fry till nice aroma arises. Let it cool down, then grind them to coarse mixture. 1) Heat oil in a Kadai/Pan and add Mustard Seeds to crackle. Then add Channa dal, Urad dal, Asafoetida and Cashews, fry till light brown. 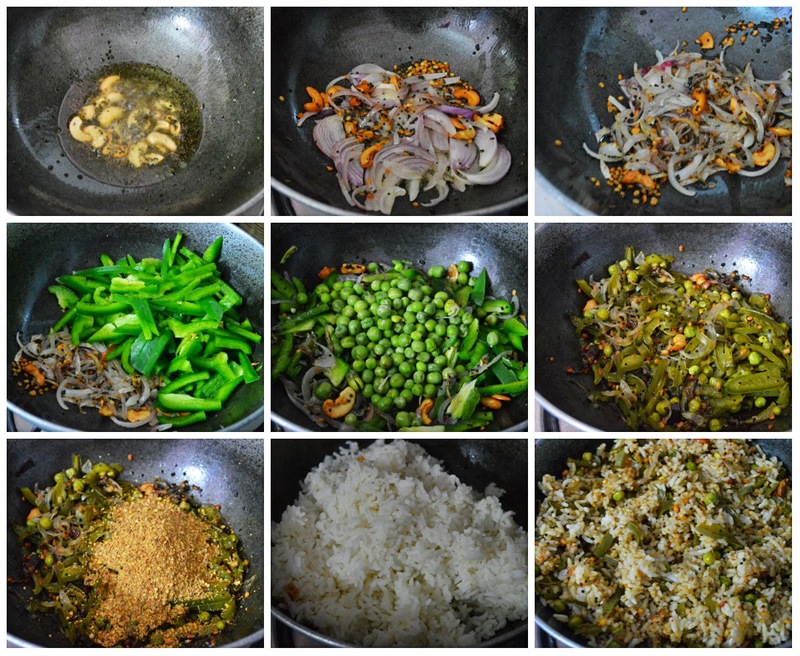 2) Add Onions and fry till light brown, then add Capsicum and Green peas and mix well. 3) Add salt and sprinkle few water, close it with a lid to cook them. 4) After Capsicum and green peas are cooked, add curry powder and mix well. 5) Switch off the flame and add cooked rice. Mix them well. Tasty Capsicum Rice is ready. 1) I have used Parboiled/Steamed variety, you can also use Raw rice or Basmati rice. 2) For all Rice varieties, cooked rice needs to be cool down before adding it. 3) If you want to prepare colorful rice, try adding Yellow and Red Capsicum too.